In the late 1660s Jacob van Ruisdael painted numerous extensive landscapes, perhaps inspired by the work of Philip de Koninck. In a similar style to Koninck, van Ruisdael assumes a high viewpoint and dedicates over half the canvas to a sky brimming with clouds. 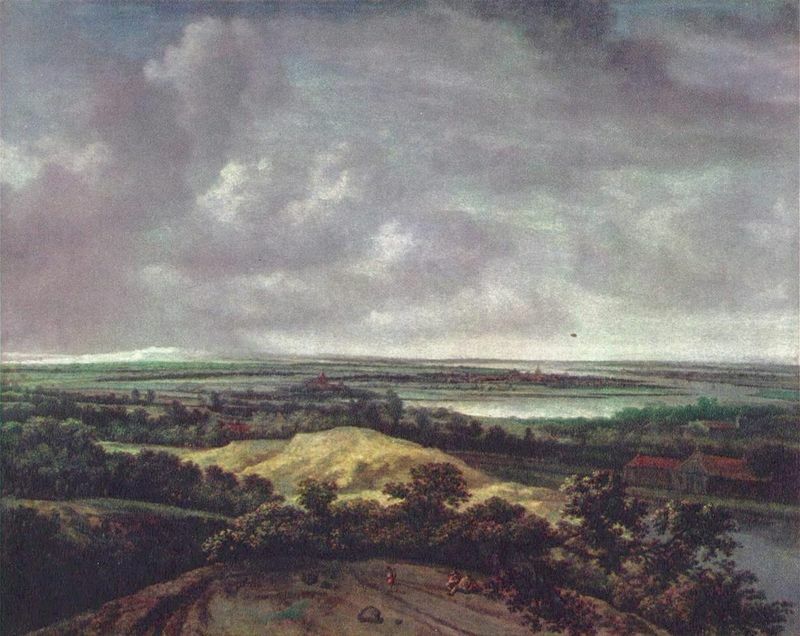 Many believe that the church in the centre of Landscape with Church and Village is St Agatha at Beverwijk, located seven miles north of Haarlem where Ruisdael lived and worked. However, there were differences in the tower he depicted and its unlikely that he was attempting an accurate take on scenery. This image may have been taken near the Dutch-German border due to the fact that the red roofs around the church once belonged to the wealthy residents of the town. 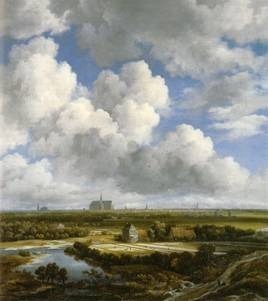 Yet, it's most likely that this painting was created from drawings made in and around Haarlem which were then taken to van Ruisdael's studio and turned into an original landscape. There are various indications that this piece was created during summertime; firstly, there is the harvesting corn and grazing sheep and secondly, there are drifting crows flying to the left of the steeple. Van Ruisdael created four other landscapes portraying the same view or part of the same view with small variations of detail. Van Ruisdael was known for painting the world surrounding him. He was greatly moved by the images he saw and his paintings are personal interpretations of scenery he encountered. Van Ruisdael must have spent considerable time in and around the Dutch countryside. Furthermore, he created paintings for a particular clientele that studied his works closely, eager to understand the message he was putting across. Jacob van Ruisdael was greatly inspired by nature yet always included some aspect of human activity in his works. He had an obsession with trees and the solitary structure and objects against nature's great vastness. This was naturally due to the influence of his uncle, Salomon van Ruysdael, who used solitary objects to create new dimensions and concepts in composition. 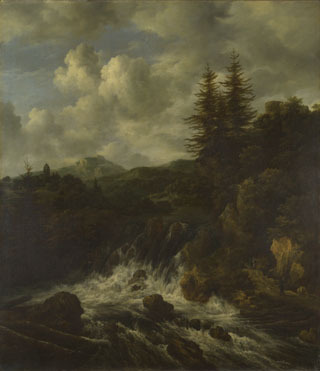 In many of Jacob van Ruisdael's early paintings, pine forests, waterfalls and stormy skies featured prominently. The artist also used his imagination to create dramatic scenes and some of the most astounding landscape art works ever produced. Van Ruisdael took landscape painting to a new level by creating nature as a metaphor of human psychology. Landscape with Church and Village depicts an image of daily life continuing amidst the wonder of nature. The vastness of nature makes the everyday human activity seem inferior as we see the sheep graze and a little town huddled together amidst the sprawling flat lands. While the infinite landscape presents the unknown aspect of human life and the overwhelming feeling as we search for the reasons of our existence beyond the familiar. The ever present clouds in his work, comes to convey the oncoming of human emotions that constantly changes and defines the landscapes. 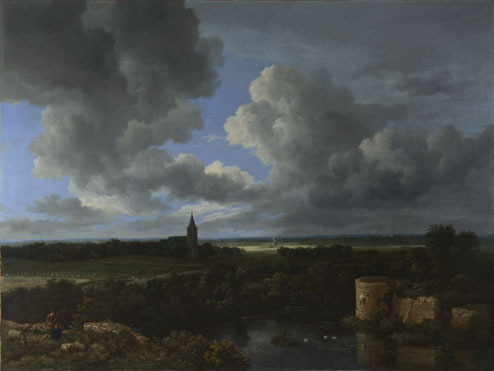 Van Ruisdael was able to paint this landscape with exact execution particularly with regard to the weather, capturing a mood of isolation and awe. The artist actually enhanced the church steeple to ensure it penetrated the skyline for compositional effects and to define its infinite depth beyond the horizon. In doing so he could bathe the steeple in sunlight and this makes it the pivotal point within the composition. The artist also creates a visual harmony by employing this method. In the foreground we see human figures and the sheep in the background are painted in smaller proportions until all objects, trees and shrubbery become infinite. This creates compositional depth and emphasizes the vastness of the landscape. As Landscape with Church and Village was created during the middle years of van Ruisdael's career, he uses lighter tones. We see more blue patches dominating the grey and white hues. We also see bold use of red ochres which stand out as decoration for the rooftops. The artist uses intense yellows for the land by the windmill and bright greens for the trees and shrubbery. The trees in the shadow help add depth to the painting. Jacob van Ruisdael created a wide range of landscape paintings throughout his career and examples of related works are listed here. Landscape with Church and Village was one of many scenic paintings created by van Ruisdael during his career. With a passion for nature and its ability to evoke emotion, the artist paid a great deal of attention to his surroundings and the landscapes he encountered. 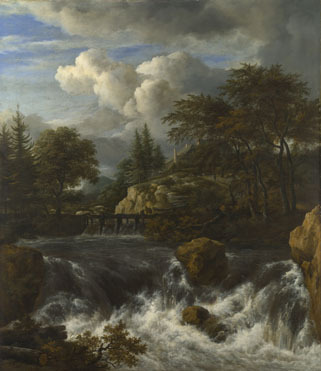 Van Ruisdael's landscapes typically conveyed a gloomy, placid atmosphere evoking solitude and dark emotions and his works demanded consideration and debate. During the 1650s van Ruisdael's palette became brighter and he used more blues to depict the sky. Landscape with Church and Village is a fine example of this changing style. 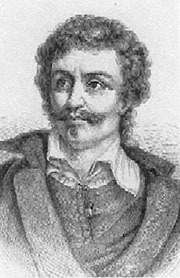 Like his uncle, Jacob van Ruisdael changed the monochromatic color scheme of traditional landscape paintings and created more colorful compositions derived from the Classical period. Trees and foliage appear greener in his later works and the images are starker and in Landscape with Church and Village the town's roof tops are painted in brighter, sharper reds. Dutch Baroque has become the most noted era in art. Artists were able to freely choose their subject matter and how they wanted to express it and this resulted in artist excelling in creating new art styles and techniques. Thus, the Dutch were prospering not only socially and economically but also in their art and culture. Deriving the Baroque style from Italy, the predominantly Protestant Dutch society would not allow the presentation or idolization of religious or biblical figures in paintings, instead favoring more conservative themes. This resulted in the Dutch focusing on more realistic painting and defining new concepts in portraiture, characterization, landscapes and still life. To find out more about van Ruisdael and his works you can refer to the literary sources listed below.